We welcome you to Vila Franca do Campo and to the holiday appartment “Casa Abacaxi”, which is semi-attached to our own private house. Our house is located in the upper part of the town, in a quiet and beautiful 4.000 sqm garden, surrounded by pineapple greenhouses and residential buildings. The property used to be a pineapple plantation, thus the name “Casa Abacaxi” (pineapple). From the garden you have an amazing view, overlooking the village, the ocean as well as the offshore bathing island “Ilhéu da Villa”. By clear sight you can see our neighbouring Island “Santa Maria”, 100km off São Miguel. With nightfall you will hear the peculiar call of the Scopoli's shearwater bird – a call which will not sound like a bird’s on first encounter. 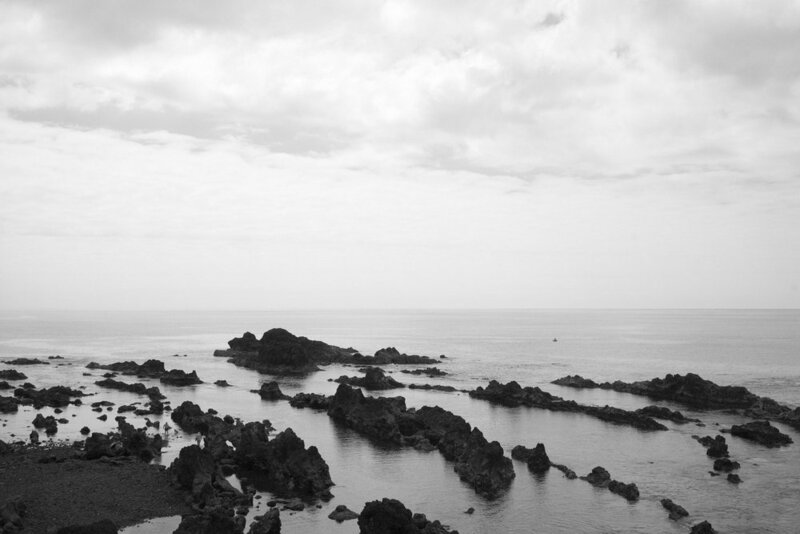 Vila Franca is a small town with a population of about 5000 people at the south side of São Miguel. The people here are friendly, welcoming and helpful, and most importantly nobody is in a hurry around here. There are a number of small shops, a big supermarket, bars and restaurants, many churches, schools, doctor‘s offices, a hospital, a fire department and many more traditional clubs. Needless to say there is a harbour as well, which is made up of a fishing port and a sailing port. At the sailing port (Marina) you‘ll find touristic activities like whale watching, swimming with dolphins, trips by boat to the close by island, diving courses, stand-up paddle, sailing tours and many more. Next to the sailing port you‘ll find the guarded beach, which is perfect for swimming and relaxing. All Acoreans love to party. And where there is a party there will be loud fire crackers. Apart from mass most festivities are accompanied by processions through town and a marching band. At times festivities turn into a small festival and bands will play. The holiday apartment is suited for two people and spans over two floors. The ground floor entails an open kitchen which serves also as the living room and accesses the sheltered patio. The patio can serve as your extended living room, garden furniture and sun beds invite to relax. In the first floor you’ll find the bedroom with a king size bed (180x200cm) as well as the bathroom which includes a shower. The apartment is 65 m2 and is provided with a private entrance. …and everything you need to make a home cooked meal! Coffee, green tea from Sao Miguel, olive oil, vinegar and fresh herbs are inclusive and will be made available by us. As a welcoming gift you will find a freshly baked whole grain loaf of bread. Fresh fruit and vegetables are available if harvested from our garden. Sat-TV (incl. German programmes), wifi, portable speakers to play music from electronic devices, small stereo for CD. Washing machine, BBQ area and garden furniture. We also provide bedding and towels for all occasions. Electronic heating provided in case of cold or humid weather. In our garden grow depending on the season Avocados, Bananas, Tamarillos, Guaves, Maracujas, Loquats, Pomegranates and figs. Aloe-Vera, camellia, bird-of-paradise, hydrangea, hibiscus, fern, amaryllis, agave and cactuses bloom seasonaly. Here you can releax, read and spend your time. We have a BBQ-Area and other place to sit and lay down. We are Heike Hellerung and György Debreceni, a married couple from Kassel, Germany. After many years of self-employment we moved to São Miguel Miguel in 2016. We speak German, English, Hungarian and some Portuguese. We can find you a local car rental in advance, who will wait at the airport with your rental car. We are always happy to recommend our favourite spots and trips on the island. Because of Vila Franca’s central location on the island, it serves as a perfect starting point for many activities and trips. By car everything can be reached within an hour. The ocean, a lifeguarded beach, supermarkets, the harbour as well as cafes and restaurants are in walking distance. 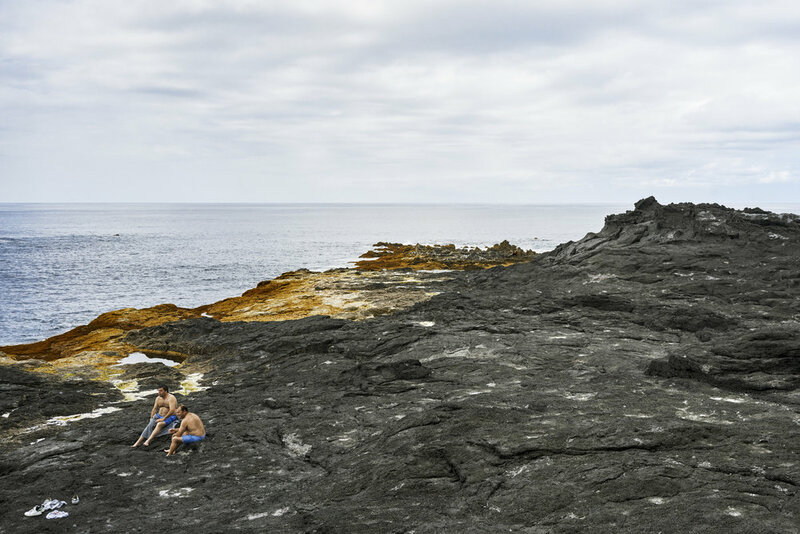 Throughout July, August and September you’ll be able to enjoy the most consistent climate with the least rainfall on São Miguel, with an average maximum temperature of 25°C. During the night it hardly cools down. During October it is usually somewhat stormier, however 20°C will be the average temperature. Contrary to estimated average, it rarely rains all day or at every point on the island. It is very likely that in Vila Franca near the sea it will be sunny and calm while 10km off to the mountains it can be foggy and rainy, and all the way at the north coast it will be clear and sunny again. It is thus not surprising to find 4 seasons in one day. The weather can change frequently and suddenly. However, the island is ever green, apart from the broad-leafed trees which will be leafless in winter and spring and start to produce leaves again in May. You should consider that the average temperature does not always tell the whole truth, the most important factor is the wind, temperatures are much lower with the north wind blowing as opposed to when it’s calm. 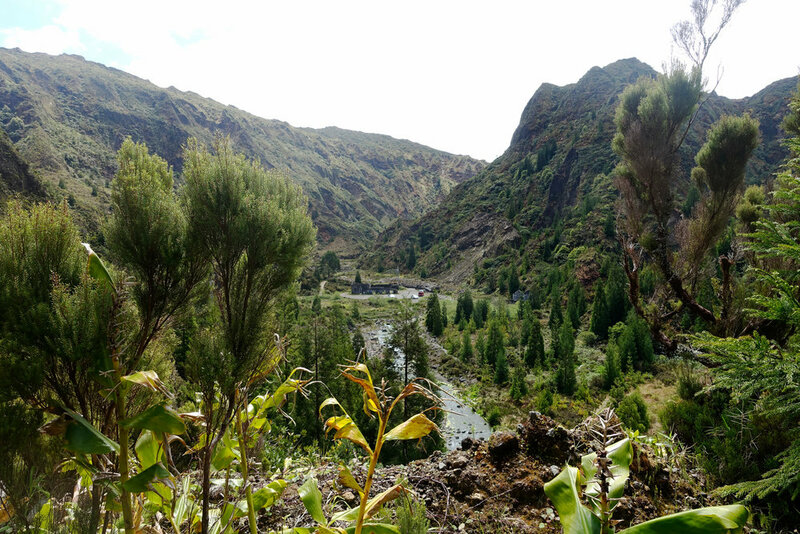 But every season has its own charm and will make your holiday on the Acores worthwhile. 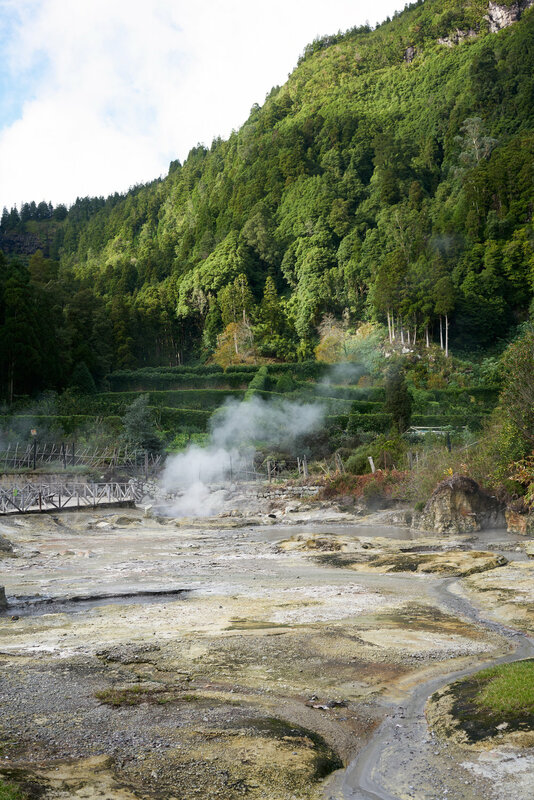 We would like to remind you that São Miguel is enjoying increased popularity as a holiday destination. During the main season (Juli – September) the main attractions, certain viewpoints, and thermal baths can be crowded and it can happen that parking lots will be full. However, there are many other beautiful spots, often times completely empty, especially if you start to explore by foot. In any case, off-season it is noticeably calmer and less crowded.